We are really excited about the opportunity to have artist and natural builder Kata Polano come to Winlaw in July to lead a clay plaster workshop, including the beautiful sculpting and decorating that is possible with earthen plasters. This is the small office we will be plastering. 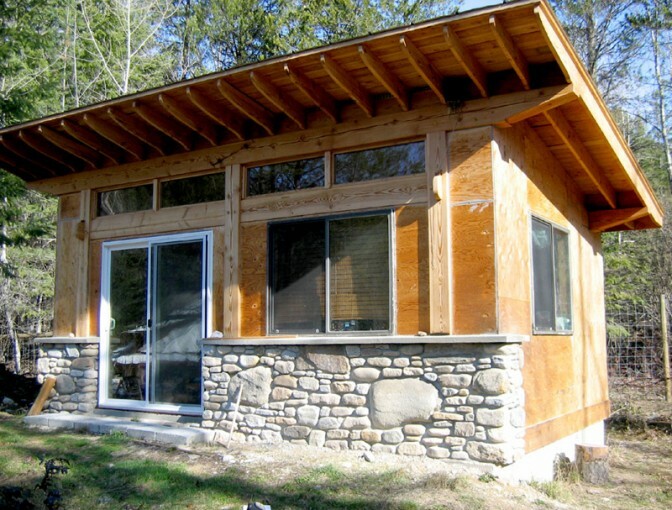 It is a super-insulated timber frame building that incorporates solar power and passive solar design. The walls are sheathed with plywood, so Kata will be showing us an effective method to integrate natural plaster with a more conventional wall system. This will allow workshop participants to adapt clay plaster to a wider variety of building projects, including new construction and renovations. The owners of this 7 acre homestead have been using permaculture design principles as they develop their buildings and gardens. The main house is one of the oldest straw bale houses in the Slocan Valley, and the office was built two years ago. Kata will be teaching us how to mix, apply, sculpt, and decorate with natural clay plaster. The workshop will show how to finish plaster on flat walls as well as sculpt artistic elements onto two of the corners of the office. To register for the workshop, visit our Workshops page.